Imagine a drill that thinks - beeping when the desired torque setting is reached while drilling screws or when the battery is overloaded, or sensing whether the battery is Nickel or Lithium. Imagine a drill that can go from driving a big augur bit to chasing a screw around a corner or against a wall to a prescribed depth, or maintaining your favorite clutch setting thanks to an independent switch for drill and driving. 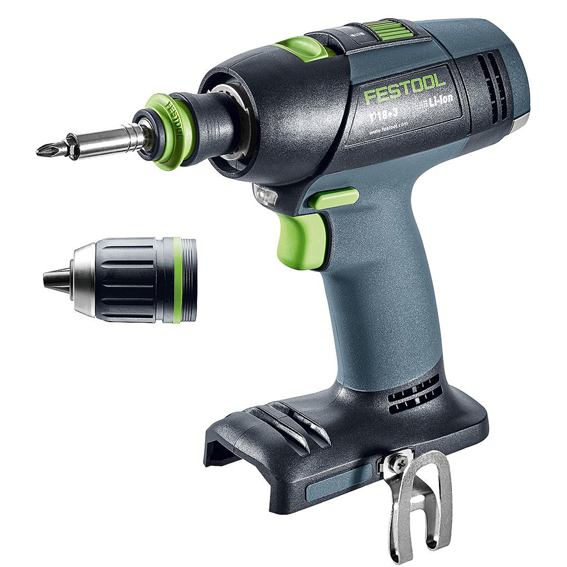 No more imagining - the Festool T 18+3 cordless drill can do all that and more. Other superior features include: A super-long-life E-TEC brushless motor; tool-less chuck and bit changes; optional chucks that make 1 drill perform like 5 different drills; a drill/drive memory function that maintains torque settings when switching back and forth; a fully electronic clutch; an LED lamp to light up the bit in low-light conditions; a fuel gauge to let you know how much charge is still in the battery; backward compatibility with Fastfix and Centrotec components and most batteries; plus, of course, great ergonomics. This "Bare Tool" version is ideal for those who may already own other Festool 18V Lithium Ion Cordless Tools. T 18+3 Drill Basic: Includes T 18+3 Drill (18.0v - 5.2 Ah); Centrotec Chuck; FastFix Keyless Chuck; and a #2 T-LOC Systainer.